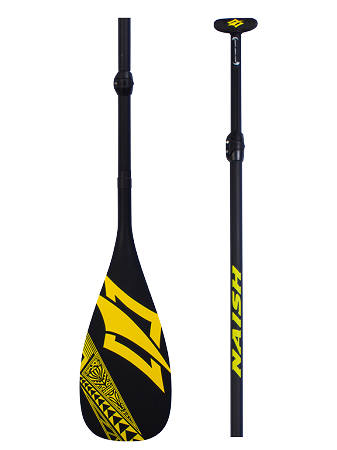 The Hele is for riders looking for performance and value in a carbon/glass fusion paddle for all-around use. It features the optimum blend of stiffness and flex-curve. Tahitian Grip: Always know where your blade is aligned by the feel of your hand on the handle. 30% Carbon Glass Pre-preg Shaft: A durable construction with the perfect balance of strength, weight and affordability. Anti-Twist Interface: Makes sure the adjustment system is locked in place, even and never able to twist. Pressure Cleat/Shaft Cross Section: The pressure cleat locks the shaft into position, applying tension around the whole shaft. Perfect Blade/Shaft Alignment: There isn’t any question if you blade and handle are aligned and with the easy length adjustment system you will be able to make changes on the fly quickly. Vario Side View: You can see that the shaft it locked in place on both sides for a super secure hold.